Brett Hartl and Troy Schafer are holding the dark and heavy mantle of shameless despair behind this dark project. Two tracks, each one is five minutes long, are buried inside 2 3″Cdrs in order to promote the heaviness and the strange hybrid of despair intertwined with aesthetic wonder. 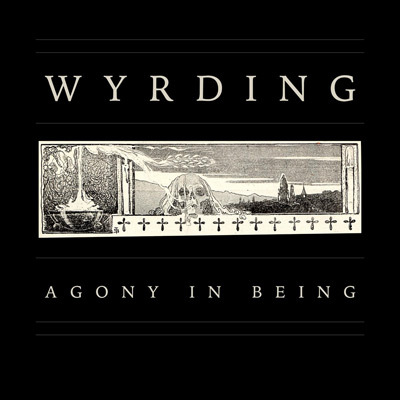 Wyrding lets tragic strings and painful piano music align with truly scorched singing on the first part of this voyage in agony. If this dark journey is through a muddy river, then this departure from land seems to put the entire burden on your shoulders. Afterwards, when the second part kicks in, it’s a ride towards the shrieking drones of the sirens who voice their weeping which is as smooth as a razor blade. “Agony in Being” is a sorrowful and beautiful release, given to us by the great and eerie hall of shifting sands congregation. This is a very limited physical offer, backed by online availability. Check it out.